Regular peel force testing is crucial to control the production process and ensure quality. Peel force testing ensures and documents that taped devices are securely sealed in their pockets, yet will release at the designated peel force. 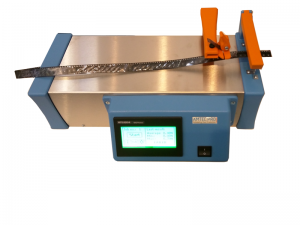 AMTEC.PRO’s peel tester incorporates leading technology and performance features for easy setup and operation, minimum maintenance and accurate calibration. Calibration can be done by the operator. The peel tester can accommodate tape widths from 8mm to 200mm and operates at peel speeds of 120mm to 300mm per minute. 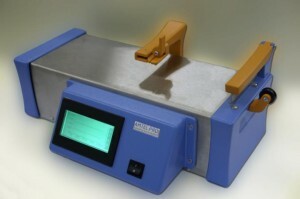 The peel tester can be operated via touchscreen terminal or connected to PC/laptop via software. The touchscreen terminal also operates as color signal display signalizing machine state or measurement status: green color signals normal operation respectively test passed okay, red color signals machine error or test passed not okay. Using a PC/laptop, AMTEC.PRO provides the software package required to operate the tester. Connecting the peel tester to the PC works via ethernet connection. Both software and touchscreen terminal allow to save testing parameters for repeating tests at later points in time.